Aled and Karina enjoyed a very pleasurable tour to Ottawa and Torono recently after a lot of work organizing by Alan Thomas, the great accompanist and Organist who invited the couple over to Canada some months ago. 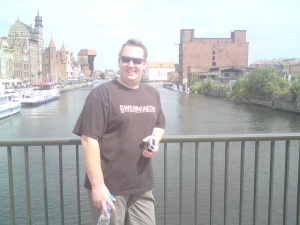 There was very welcoming parties and events organized, and Aled had great pleasure in singing at all venues. Aled and Karina would like to thank everybody in Canada for their support and kindness while we were there. Thank you very much indeed. These two other links are to reviews of Aled's concerts at Ottawa & Toronto. Thanks for the kind words. Aled has now arrived back in Wales and is ready for a very busy season of concerts, starting this weekend at Pontrhydfendigaid where he will be recording songs for the popular TV programme on S4C, "Noson Lawen". This will be televised over the next few months. Aled will also be performing at various venues over the country. Please go to the Diary for more information. On the 1st of October, 2009 Aled will again be on his travels, when he will fly out to Canada to perform in a series of concerts with accomplished pianist, Alan Thomas. Aled met Alan Thomas in Chicago last year when Aled performed at the North American festival of Wales, with Alan invited to be his accompanist. After the festival, Alan has been very bust organizing a concert tour for Aled to sing in Ottawa and Toronto. Although Alan Thomas is a Welshman, he has been living in Canada for many years and is a very familiar face in concerts and music festivals all over North America. He is a very special accompanist and a very talented organist. 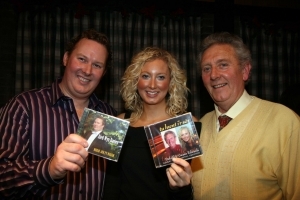 Aled and Alan will perform in numerous events including two special concerts. The first concert will be at Westminster Presbyterian Church, Ottawa on the 4th of October at 3pm, followed by a special concert at the Dewi Sant Church, Toronto on the 6th of October at 7pm. If you have relatives of friends living in one of these cities, please urge them to come along!! So a very pleasurable, but busy ten days for Aled in North America!! Look forward to reading all about it soon! Eisteddfod of Wales. This concert went so well that two other venues have been booked to perform the show again in October in Llandudno and Cardiff. There are ticket lines open now for some of you that missed the show in August. Go to the diary page for links to the ticket offices. Coming up in the Autumn for Aled are many concerts all over the country, and also a special trip to perform in Canada in October. Aled will also sing in Cardiff in Côr Godre'r Garth' 35th year anniversary concert; in Llandeilo with Bass, Huw Euron; a special concert to open a new community hall in Machynlleth; return visits to Whitwick Manor, Llangain and Chester Cathedral; and performances for S4C's religious programme, "Dechrau Canu Dechrau Canmol" which will be screened in October. For more details go to the Calendar by clicking to the Diary page. The classical Group after the final concert! 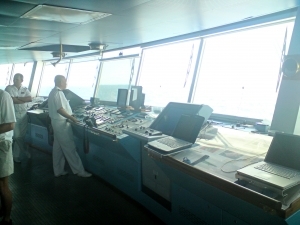 The captains bridge on Minerva! The Winter Palace, St Petersburg. The coming two months will be a very busy time for Aled with performances in Bala, North Wales and as far as St. Petersburg in Russia!!! A recent invitation by cruise company Swan Hellenic means that Aled will be singing on their ship, Minerva for two weeks in July. The cruise will visit numerous cities in Denmark, Sweden, Germany, Poland and Russia. Joining Aled in the classical concerts will be Soprano, Diana Palmerston, Sian Meinir (Mezzo) and accompanist, Eirian Owen. This will I'm sure be a great cruise and a report will be shown here soon!!! More news will be posted soon. Following a very successful Christmas concert at Chester Cathedral in December, Aled will again sing in aid of the Nightingale House Hospice Appeal on Thursday, 26th of February. This special concert will be held at the St Giles Church, Wrexham at 7:30pm. Aled will be joined on stage by Internationally renowned choir, Côr Godre'r Aran, and harpist, Rhiannwen Pugh. Tickets are now on sale at £10, and are available from the Income Generation department at Nightingale House Hospice, Chester Road, Wrexham. Call (01978) 314292 for more information. of a scolarship fund in memory of Aeron Gwyn Jones at the Gadair secondary school in Dolgellau. Aeron was a close friend of Aled; a young Baritone that lived in Caergeiliog in Anglesey. He won the coverted Blue Ribband Award at the 2005 National Eisteddfod on his first attempt and was a popular concert soloist all over North Wales. A farmers son, but Aeron also worked as an accountant in Bangor. Unfortunately, Aeron died last year at 31 years old after a long illness. This concert, on Sunday the 9th of February will feature Côr Godre'r Aran; Aled Wyn Davies (Tenor); Tom Evans (Bariton); Brian, Daniel a Miriam Hughes (Instrumentalists) at Ysgol y Gader at 8pm. Tickets are available by contacting Aled on 07759 833335. DECEMBER 2008 : A BUSY CONCERT SCHEDULE FOR ALED BEFORE XMAS! 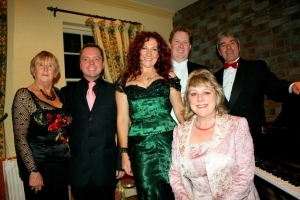 with the popular Welsh Diva,Shân Cothi, Piano and Harp duet,Piantel, and compere Glyn Owens in a charity evening towards Marie Curie. The evening was such a success that all artistes have agreed to come back for another charity event in October, 2010. Following this, Aled sang in a concert in Llanfyllin with the Penybontfawr choir and folk-singer, Linda Griffiths; and then two concerts with the Mezzo-soprano, Sian Meinir. The first being at Llangain, near Carmarthen with Côr Seingar; and secondly at Llanbadarn Fynydd with theTalgarth Male-voice choir. Both were lovely evenings, and I must say the spread of food at both these concerts was top-notch!!! Another engagement for Aled this year was a performance at Manchester town hall with Soprano, Diana Palmerston and accompanist, Eirian Owen. This concert was for over 600 land girls where they had a celebration together for their efforts during the war. They enjoyed some nostalgic songs from the period they were land girls at different parts of the country. This was a lovely afternoon, and Aled, Diana and Eirian were thrilled to be part of the occasion, and to sing in such a lovely concert hall! Click here for media review! of the highlights of Aled's career, and it was an honour indeed to perform at such a prestigious Cathedral. 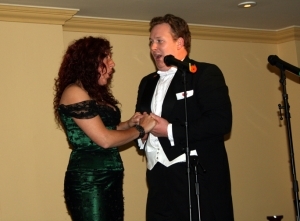 On Thurday, 11th of December, Aled performed at 2pm to 300 passengers off the Orient Express luxury train. The guests had travelled from Edinburgh for an afternoon in Chester, and a short concert by Aled at the Cathedral. Following the successful afternoon, Aled prepared for the main event, where an audience of over 700 filled the Cathedral's main hall for a fantastic concert in aid of Nightingale House Hospice, Wrexham. Joining Aled on stage was the Froncysyllte Male-Voice choir (Voices of the Valley), Ann Atkinson,Phoenix Brass, King's School Schola Cantorium, and compere William Roach(Ken Barlow from Coronation Street), and there was high praises at the end of the evening for all artistes, and all for a very special cause. Aled would like to thank Louise and all at Nightingale House for the opportunity to sing at such a spectacular location. There will be photos of this concert posted here soon. Watch this space!!! Before Christmas, Aled will be performing again in concerts at Stoke-on-Trent with the Fron Choir; and in Pennant, near Aberaeron in a Christmas Concert with Ifor Lloyd and the local YFC club. Aled performing the Spanish favourite, Granada!! NOVEMBER 2008: WATCH ALED'S INTERVIEW ON FARMING TV PROGRAMME HERE!! In May, 2008 Aled was interviewed on his farm in Llanbrynmair by Ffermio's Daloni Metcalfe and was recently screened on S4C. Aled was discussing the contrast of himself singing on the international stage, and farming from day to day, including sheep-shearing during the summer months!! Some of you would be amazed to hear that Aled was in the Welsh shearing team that won the 5 nations competition in 1999, following his win at the Royal Welsh show in 1998 - where he won out of 60 competitors!!! with Sian Meinir, Diana Palmerston, Eirian Owen and Tom Gwanas as part of the Tabernacle Festival. under the leadership of Mari Morgan. We had items by Aled and CF1 choir, and the festival ended with a fabulous Welsh song from Aled and the choir. A lovely conclusion to an enjoyable week. Thank you all who we met in Chicago for such a warm welcome – It was a pleasure to be in your company. 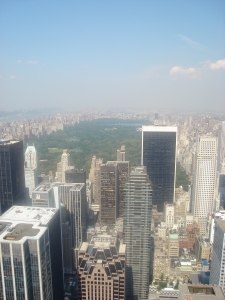 The trip finished following a few days in New York – a very spectacular and busy place, but we came across friends from Llanbrynmair, Menna and Iwan who were on their honeymoon!!! The World is not as big as you think is it!! border at Church Stretton & Wightwick Manor, which is a beautiful and historical house run by the National Trust near Wolverhampton. Joining Aled on stage were the Llanfair Male voice Choir at Church Stretton; and Contralto, Sioned Wyn shared the evening at Wightwick Manor. for a spectacular re-opening of the hall following refurbishment. Aled had the pleasure of Dai Jones, Llanilar as compere with Aelwyd Bro Ddyfi sharing the stage too with their amusing items. It was a fantastic evening and everybody went home saying how much they had enjoyed a great feast of music and laughter!! The weekend ended for Aled with a lovely concert at Cerrigydrudion with Cór Gore Glas. Aled would like to thank everyone for the opportunity to sing in these fabulous and different locations, and special thanks too to the accompanists that have assisted at each and every one. Thank you to you all. 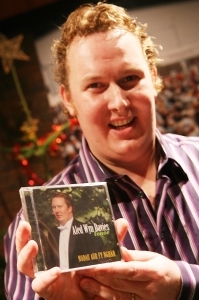 There's a busy period ahead again for Aled from now until Christmas with various concerts all over the country. His next concert will be at Oswestry with the diva,Shân Cothi,Piantel and Glyn Owens. It promises to be a special evening. 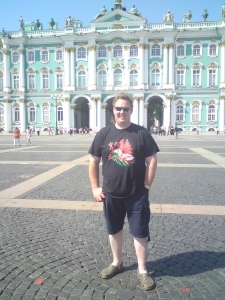 For more details of Aled's upcoming concerts, please click on his diary page. 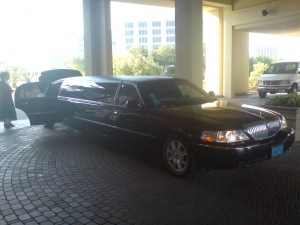 Traveling to and from the festival in style!!!! A light refreshment following the last concert!!! 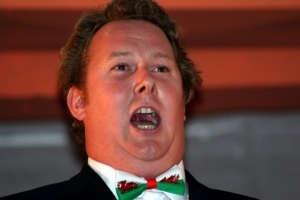 Aled has recently accepted a special invitation to perform at the famous “Gymanfa Ganu” of North America, or the “North American Festival of Wales” as it is now named, at the end of August, 2008. This festival, that attracts up to a thousand ex-pats from all over the World is an annual event that travels to different cities across the USA and Canada to celebrate their Welsh culture. This year's celebration, in it's 77th year is held in the “Windy City” of Chicago, Illinois and will be staged between the 28-31st of August, 2008. The festival has this year invited all their guest artists from Wales, which includes folk singer and poet, Fflur Dafydd from Carmarthen and the very popular and award-winning choir from Cardiff, Côr Aelwyd CF1, conducted by Eilir Owen Griffiths. It looks like the Welsh are in for a very enjoyable time in Chicago!! The festival will start with a concert by Fflur Dafydd on the Thursday night before an evening banquet on Friday followed by a concert by guest soloist, Aled Wyn Davies. On Saturday there will be a full day of Eisteddfod competitions including music, recitation, dancing and poetry competitions. The day will also include presentations and seminars by invited guest speakers, before a grand concert on Saturday evening with Côr Aelwyd CF1. The festival will conclude with the “Gymanfa Ganu” on Sunday afternoon and evening were Aled will again perform some Welsh renditions. There will time I'm sure for Aled and Karina to spend some time visiting the city before flying to New York on the way home for a few days relaxation!! It sounds like a great trip!! 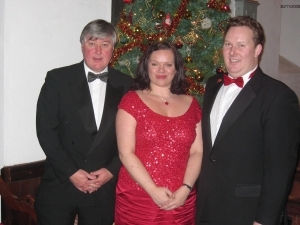 Galeri, Caernarfon at Hogia'r Ddwylan's annual concert with Baritone, Iwan Wyn Parry and harpist, Angharad Wyn Jones. The choir is conducted by Ilid Anne Jones and she will also accompany the evening's soloists - a great evening's entertainment. Then on Sunday, 18th May, Aled will sing in Dothan, Anglesey in a concert with local soprano, Sharon Evans and the popular Baritone from Dolgellau, Trebor Evans, Gwanas. 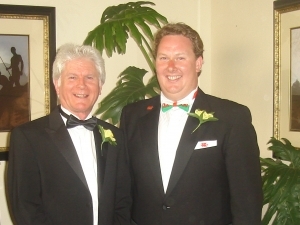 At the end of May, Aled and Iwan Wyn Parry will return to Newtown for the second year running to accompany the Newtown & District Male Voice Choir at their annual concert. It's an honour to be invited back the following year and let's hope it'll be as successful as last year. This concert is at Newtown's baptist chapel on Sunday 31st of May. Rhug, Corwen on the 6th of June, in aid of Clwyd's appeal as sponsor county for this year's Royal Welsh show. He will share the stage with Hogia'r Wyddfa, Steffan Rhys Hughes, Piantel, Kate Griffiths and more. 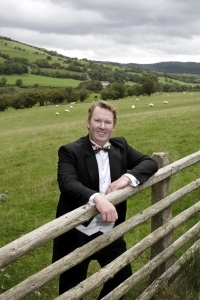 On the 7th of July, Gwyl Fawr Aberteifi (Cardigan Music Festival) have invited Aled as guest soloist at their Eisteddfod's closing concert with the Crymych & District choir. “Music on the Meadow” is a new venture by organizers in the Builth Wells area where guests are invited to sing in an open-air concert. Aled will perform in this special evening on Friday 1st of August. Remember to bring your hamper and wine for a relaxing evening of music!!! 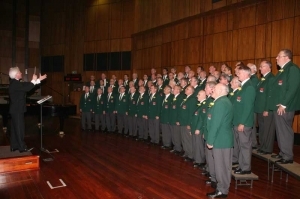 Aled and Karina returned from a very enjoyable trip to South Africa in early March following a great concert at the Linder auditorium in Johannesburg with the Welsh Choir of South Africa, conducted that evening by Alwyn Humphreys. We thank the choir and the Welsh society of Witwaterstrand for the welcome and special hospitality while we were in your company. A special thanks to Welshman Tony Davies and his wife, Wendy for looking after us so well. It was a pleasure indeed to sing in this special St David's day concert and hearing the choir sing nearly half their repetoire in Welsh, and that with only one Welsh speaker in the whole choir. We congratulate you and good luck in the future. Let's hope we can enjoy your company again sometime! 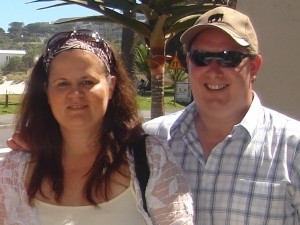 Aled & Karina relaxing in the South African sun near "Llandudno" beach, Cape Town! David's day concert and invite acclaimed soloists to join them. Over recent years they have attracted world-famous artists including Hayley Westenra and Rhys Meirion. But this year, Aled has been invited by the choir as well as two of Opera's most famous names at the moment - the tenor Gwyn Hughes Jones, and New Zealand born bass-baritone, Jonathan Lemalu. 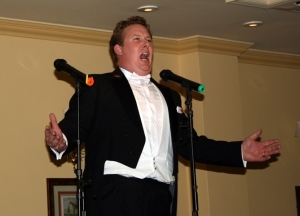 Gwyn Hughes Jones has recently enjoyed tremendous success as a leading operatic tenor, and is about to play the lead role in Puccini's classic "Tosca" with the Los Angeles opera under the leadership of Placido Domingo. Jonathan Lemalu is also travelling the World as an opera singer and is recognised as one of the World's best bass-baritones. Aled enjoyed a great welcome from the Welsh comunities of Patagonia on his recent concert tour of southern Argentina as a soloist with the renowned choir, Côr Godre'r Aran. There will be a detailed report of Aled's exploits in South America very soon! PATAGONIA HERE WE COME, AND RIO TOO!! On November the 15th Aled and his wife, Karina will start their tour to Argentina and Brazil when he will be singing in six concerts as guest solost with the renowned choir "Côr Godre'r Aran" from North Wales. They will travel and perform concerts at Buenos Aires, Bariloche, Esquel, Trevelin, Trelew, Gaiman and a relaxing few days in Rio de Janeiro before heading home. The Welsh community in Patagonia and really looking forward to greet the choir as they haven't been there to sing since 1970 - before Aled was born!! There will be a great atmosphere in South America over the next few weeks. You can look forward to read all about the tour soon! Aled will be performing at Wales's most important events this summer - One concert at the Royal Welsh show at Builth Wells, and one at the National Eisteddfod of Wales in Mold, Flintshire. On Wednesday, 25th of July at 7pm a concert will take place at the new "Meirion Shearing Centre" at the Royal Welsh show to raise funds for the upcoming Shearing World Championships that will be held at the show in 2010. Sharing the stage with Aled will be the Builth Wells male-voice choir, Meinir Jones from Llanrwst, and compere Aeron Pughe from Machynlleth. Aled has been a member of the Royal Welsh shearing committee since 1998 and is looking forward very much to the evening. Tickets are available from committee members or by contacting the show's office on 01982 553683. Come along and enjoy! Then on Tuesday, 7th of August Aled will have the privilege of singing in one of the special concerts organized at this years National Eisteddfod of Wales in Mold, Flintshire. Aled feels this is a great honour and will perform with the Eisteddfod choir and established singers and winners of the prestigious Blue Riband themselves - Iona Jones (Soprano) and Iwan Wyn Parry (Baritone). 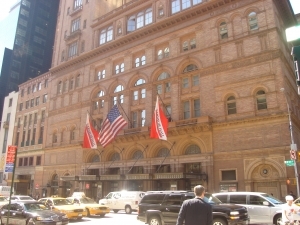 The evening will include a performance of Gounod's "Messe Solennelle de Sainte Cecile." Tickets for this concert are available by contacting the Eisteddfod's ticket-line on 0845 122 1176 (Mon-Fri 10am - 4pm). I'll look forward to seeing you all there! This month looks like being a very busy period for Aled. Following a tiring lambing season on the farm, the concerts have already started again, and on the 28th of April a fabulous evening of music was organized at the Tabernacle Arts centre at Machynlleth when Aled shared the stage with Diana Palmerston (Soprano),Sian Meinir(Mezzo-soprano), Tom Evans (Baritone) and one of Walesâ€™s leading accompanists, Eirian Owen in a very enjoyable concert. There was much praise following this performance with several quotes like The best concert I've ever seen!! The intention is to take the evening to other venues in the near future, and if you would like to see this concert in your area please contact the organizer, Dennis Jones on 01654 761500 for more details. 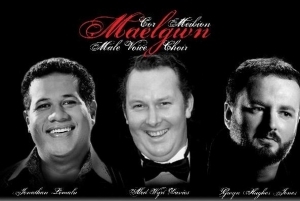 The following weekend Aled enjoyed two concerts with two of Wales's most famous male-voice choirs. On Friday, 4th of May he enjoyed the company of CÃ´r Godre'r Aran, Sian Meinir,and Dai Jones, Llanilar in a superb concert at the Rhyl pavilion, and the following night, Aled was much closer to home when he shared the stage with the Fron choir and their conductor Ann Atkinson. This choir has enjoyed enormous success lately following their new album Voices of the Valley, and it was great to see the Church in Llanfair Caereinion packed to the rafters to see this concert. Some people had travelled a great distance to see the choir, one couple from Lincoln, and another couple from New South Wales, Australia!! Another two concerts face Aled again next weekend - Burry Port on the 12th of May with Côr Godre'r Aran; and at Newtown on the 13th with Iwan Wyn Parry & the Newtown Male-voice choir. Côr Godre'r Aran on their way to Patagonia! 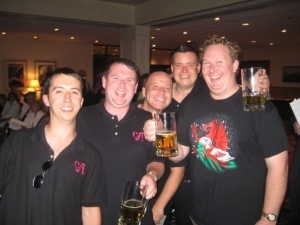 Over the last few weeks Aled has accepted an invitation from Wales's leading Male-Voice Choir, Côr Godre'r Aran to join them as guest soloist on their concert tour to Patagonia in November this year. This will be the first visit for the choir and their musical director, Eirian Owen to the Welsh regions of Argentina since 1970, but the second time Aled will visit the country this year following his South-American cruise in February. There will be more details regarding this tour over the next few months. ALED'S SONGS NOW AVAILABLE ON I-TUNES! 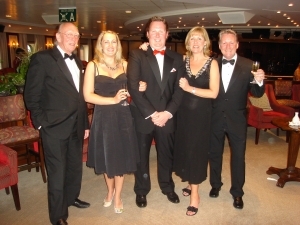 MARCH 2007: A CRUISE TO REMEMBER! The latest cruise Aled and Karina went on was a very special tour, and one to remember for ever. The trip started by flying down to the southern tip of South America to the city of Punta Arenas in Chile to meet the ship Minerva II. The scenery was beautiful around this area with penguins and fabulous glaciers while cruising down the Beagle channel. The weather was very windy around Cape Horn, but we were very privileged to be one of the few people to even see it. We then visited Ushuaia, the most southern town in the World before heading to the Falkland Islands. This was very similar to the hills of North Wales with sheep everywhere! We walked around Port Stanley and also visited Long Island farm where Aled had an opportunity to show the Minerva II passengers his talent of shearing sheep instead of singing. This came as quite a shock to some people especially as they didn't know then that he was a farmer!! After two days at sea we arrived at Puerto Madryn, the town where the first Welsh settlers landed back in 1865. We took an excursion to Gaiman where many Welsh speaking residents live. This is a beautiful little town with traditional Welsh houses everywhere! We visited one of the many tea-houses in the town and listened to a wonderful local Welsh choir and it was an honour for Aled and the choir to sing a song together for the Minerva II audience. We met Billy Hughes, a singing Welshman who only spoke Welsh and Spanish and he happily took us both around the area for the afternoon. This day in Patagonia was one of the highlights of our cruise and a day to remember for a very long time. It was amazing to see the Welsh language being used so easily by the young local residents. We look forward to going back there again very soon. 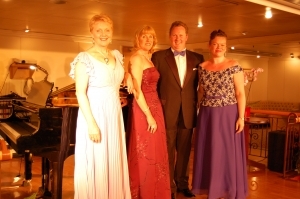 The following two days were again on sea as we headed towards the North of Argentina, so it was time to perform another classical concert on board the ship. Joining Aled this time was soprano, Diana Palmerston and mezzo-soprano,Alexandra Tiffin with renowned accompanist John Wilson on the piano. We had three fabulous concerts on board with rousing pieces from opera favourites and it was great to see the concert hall over-flowing each night. The last two days of out cruise was just amazing! We sailed into Rio de Janeiro to see the most beautiful scenery you could possibly imagine. There was Sugar-loaf mountain straight in front of us, Copacabana beach to the side of us and the famous statue of Christ the Redeemer up in the distance on Corcovado mountain. 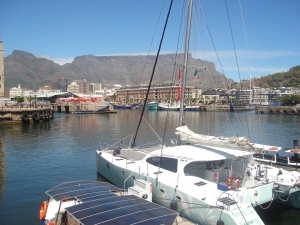 You could never choose a better place to finish your cruise and we were certainly not disappointed. The carvival season had just finished in the city, so a group of local entertainers came on board the ship to give us a fabulous show. We heard that some passengers requested that the medical centre should been open all night just in case!! As we look back, we must say that this cruise has been the best yet. The contrast in scenery and weather has been tremendous as we travelled from country to country. 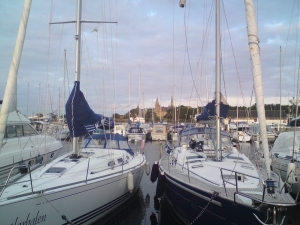 We have met many new friends on Minerva II and we also thank Martyn Harris, our co-ordinator for inviting us once more. Thank you Swan Hellenic for a wonderful cruise and let's hope an opportunity like this will arise again in the future! 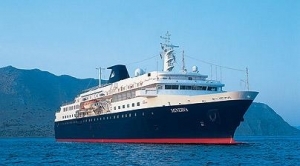 of February when they will travel down to the Southern tip of South America to board the cruise-ship Minerva II. 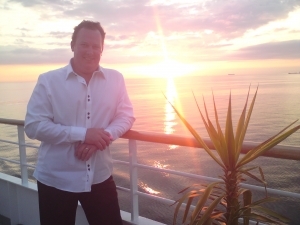 Aled accepted an invitation to sing on this fabulous ship for the fourth time after successful trips to Asia, North America and Europe. An eighteen hour flight awaits as they fly to Punta Arenas in Chile before visiting the Falklands, Patagonia, Argentina, Uruguay and Brazil. There are Welsh settlements in parts of Patagonia and Aled hopes to meet some of the Welsh speaking settlers at the town of Gaiman. 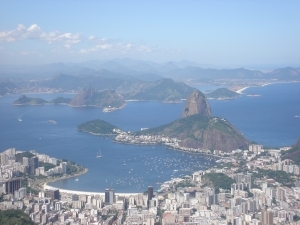 Another highlight to look forward to is the stunning views while sailing into Rio de Janeiro. Look forward to read about it all next month. Bon Voyage!! Click here for cruise itinerary. Aled will be performing on the S4C Digital programme "Wedi 3" on Friday the 26th of January at 3 o'clock in the afternoon. 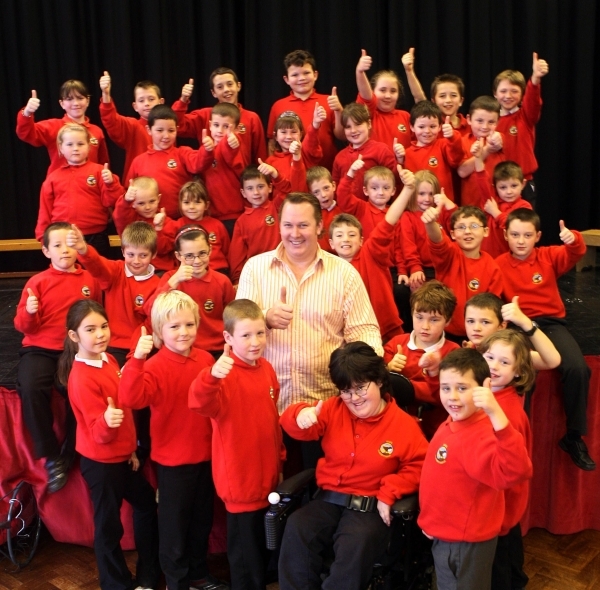 He will sing a song and also have a chat with presenters Elinor Jones and John Hardy. Remember to watch! Aled enjoyed two enjoyable nights at the end of November when he launched his debut album, "Nodau Aur fy Nghân"
On Monday, November the 27th, friends and family came together at the Royal Welsh Winter Fair at Llanelwedd in a special launch night organised by the record label "Sain". Aled gave the audience a brief taster of some of the songs on his new CD; we had items from Dafydd and Gwawr Edwards who have also released their new album, and also the launch of the DVD "Cefn Gwlad - Y Berwyn", which is a series based upon the four seasons on the Berwyn mountains. Dai Jones, Llanilar was present to compere the evening in his own special way and at the end of the evening, Aled had a memorable experience when Dafydd Edwards, Trebor Edwards and Dai Jones ( all Welsh singing tenors and farmers!) joined him in a special rendition of a well-known Welsh hymn. A night to remember! Then on Wednesday, November 29th, Aled had a pleasurable shock when he saw that the Llanbryn-mair Community Centre was overflowing with people because a secret tribute night had been organised for him following his success in winning the Blue Riband during the summer. The night's compere was Dilwyn Morgan from Bala and there were items performed by pupils of the local primary school and by Aled himself. During the evening, humorous stories and praise for Aled were given by Penri Roberts, Hedd Bleddyn, Meirion Jones and Magwen Pughe. The school's headmistress and evening event organiser, Bethan Bleddyn, thanked all who were involved and presented Aled with a poem written by the well-known local poet, Dafydd Wyn Jones.